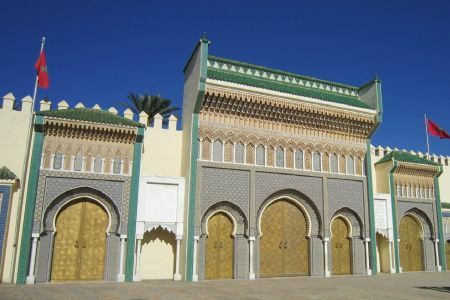 The monumental Bab Boujloud Gate or Blue Gate is the main entrance of the medina. Built at the beginning of the 20th century (1913), the gate attracts attention by its tile work ornamentations which are blue on the exterior facade and green on the interior. Next to the gate, visitors can discover the ancient water distributor, the masterpiece of the medina's water supply network. This is both a madrasa (school) and a mosque and for this reason has a minaret.The madrasa is one of the few religious places in Morocco that is accessible for non-muslim visitors. Opposite the Madrasa Bou Inania is the Dar al-Magana, a wall with a hydraulic clock that was built in conjunction to the madrasa. The madrasa is open except for the prayer hours. 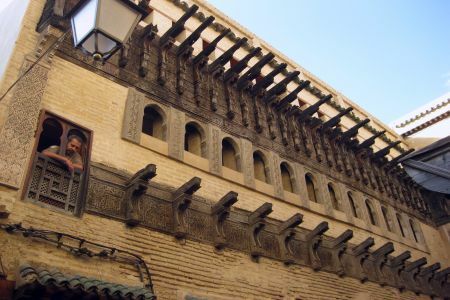 Dar al-Magana (Arabic for "clockhouse") is a house built in 1357 whose facade contains a hydraulic clock with a primitive but sophisticated mechanism driven by water wheels which is today not more in action. Near the Al-Qarawiyyin, it was built by the Merinid sultan Uthman II Abu Said and takes its name from the Souk al-Attarine, the near spice and perfume market. 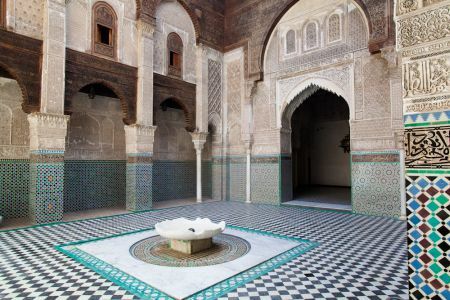 Beautiful small medersa with ornately carved plaster walls, classic tiles and cedar woodwork. The Zaouia (shrine) of Moulay Idriss II is the tomb of the son and much more venerated successor of Moulay Idriss I, the founder of Fez. Non accessible for non muslims. 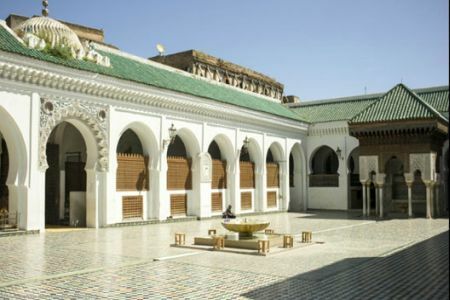 This is also both a madrasa and a mosque and the oldest, still operating university of Morocco, founded in 859 by Fatima Al-Fihria, the daughter of a rich merchant whose family migrated from Tunisia. The mosque is not accessible for non muslims. The Fondouk Nejjarine is home to the Museum of Wooden Arts and Crafts, or Musée du Bois, located near the Henna Souk. 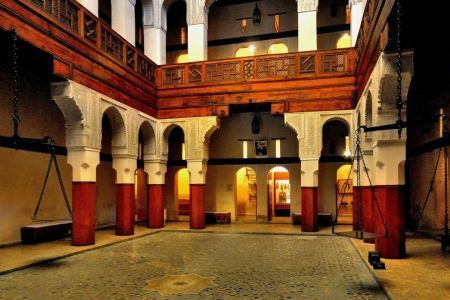 As the name suggests, this museum shows the skills of carpenters and woodcarvers of Fez. 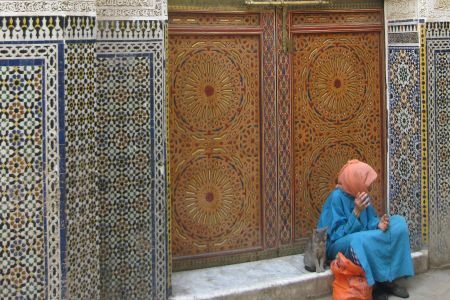 Outside is the Nejjarine Fountain, one of the most beautiful mosaic's fountains of the medina. A Fes institution, little changed for centuries, the tanneries or Chouara is the most amazing sight in the medina. 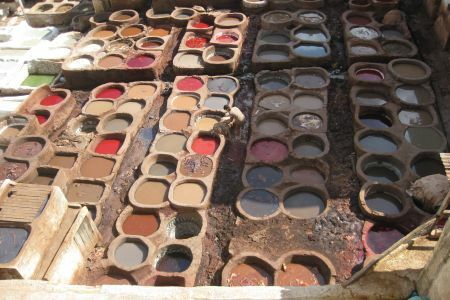 Leather workers trample on animal skins with their feet in round large stone vats of pigment, their bare legs stained by dyes. The tanners' yard can be best seen from the surrounding roof terraces. The Royal Palace sits on a huge piece of land of 80 hectares, surrounded by beautiful gardens. 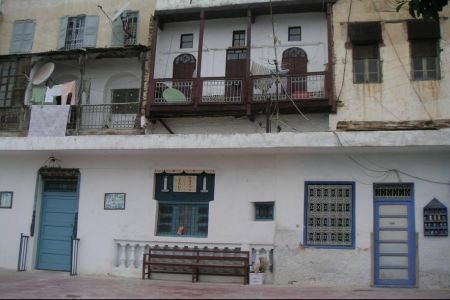 Built in the 17th century by the Merenid sultans, it is situated in the centre of Fés el Jdid. The building is not open to the public but can be admired from outside. It is the residence of the King when he visits the city. 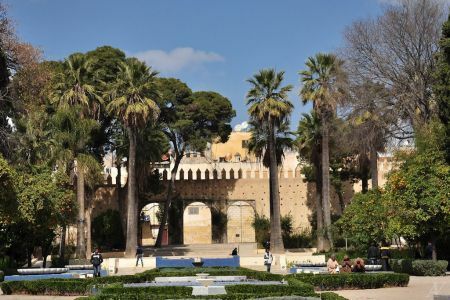 This peaceful pleasure garden is located between Fez-al-Bali and Fez-Jdid and has been newly reopened. It has a great collection of cacti, herbs and bamboos and offers a cool retreat from the bustle of the medina. 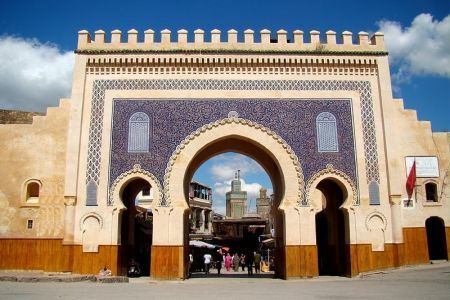 This gate is also a main entrance into the medina, hence less monumental than Bab Boujloud and opening onto a large newly renovated square in front of the mosque of the same name and leading into the Al Andalous quarter. Distance from Riad Sabah Hotel: 10 minutes with taxi. In Morocco, a mellah is a quarter surrounded by walls where Jewish people were confined since the 15th century. It was first seen as a protection and a privilege but produced finally a sort of guetto. Faced with an uncertain future after Morocco's independence in 1956, nearly most of Fez's Jews migrated to Israel, the United States or Casablanca. Distance from Riad Sabah Hotel: 1 km - 15 minutes walking distance. 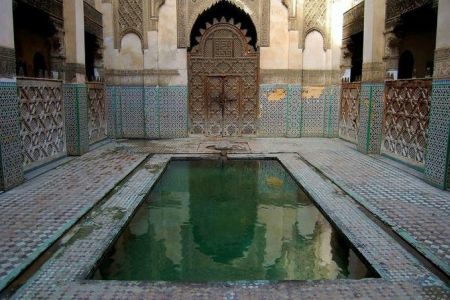 Built in the year 1321, the Sahrij Medersa's name was derived from a pool that is located inside of the medersa ("sahrij" means pool in Arabic). 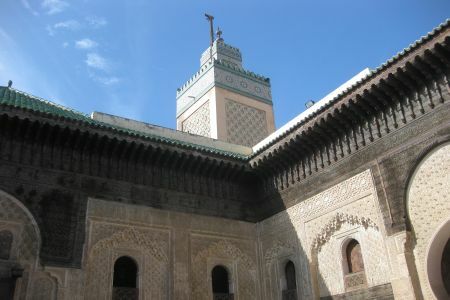 The most typical features of the medersa are the two white and green minarets that can be seen on the top of the building. 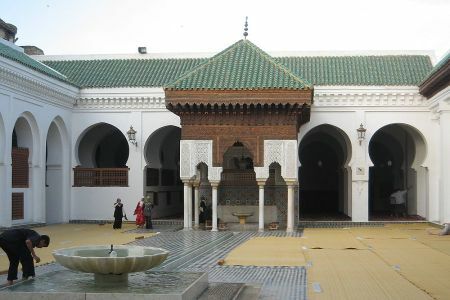 The medersa is still used today as coranic school and sometimes, students can be heard practicing their verses. 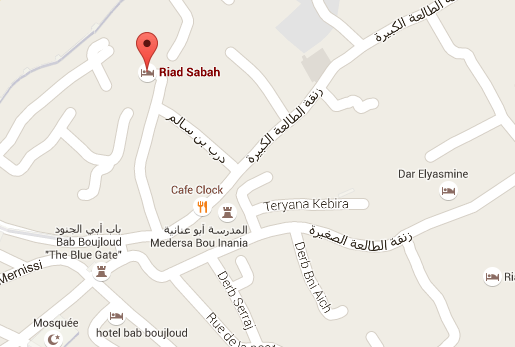 Distance from Riad Sabah Hotel: 800 m - 10 minutes walking distance. 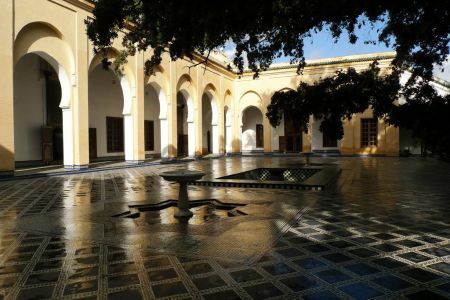 As summer palace built in the 19th century and converted in 1916 to a museum by the French, the Batha Museum houses a beautiful collection of traditional Moroccan arts and crafts. It also shows some fine Fassi embroideries, colourful Berber carpets and antique music instruments. The mausoleum hostes the tomb of a north african holy man named Sidi Ahmed Tijani which attracts every year droves of disciples coming even as far as from Senegal, Mali and Niger. He lived in the 18th century and widespread a more traditional islam, closer to the Koran. 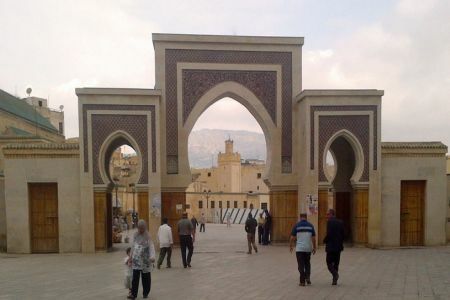 After visiting many african countries, he finally settled in Fez where he died in 1815.